As many of you have probably guessed, we here at Into the Book love books. Shocking, I know. And because we are now expanding as a website, we have the opportunity to offer even more resources to you as you are searching for great new books. And what better way to do that that to give one away? Yes, that’s right! It’s time for a book giveaway!! Ok, so here’s the deal. You may comment either on this post, the note that we will have on our Facebook page, or on Twitter. You may find a link to our Facebook page on the right sidebar of this website. The giveaway will start today, July 18. It will be shut down on August 1 at noon EST, and the winner will be announced and contacted soon after that! You may enter on any of these websites (Into the Book, Facebook, and Twitter) to double or even triple your chances of winning! But please do not comment or enter more than once on a single post. Those who enter more than once on a single website will be disqualified. We also need you to have some sort of account (Blogger, Facebook, Twitter) in order for your entry to be valid. We need this to be able to contact you and to validate your entry. No anonymous entries will be accepted. On twitter, you may only enter once, by tweeting with the hashtag #itbgiveaway. (Two tweets by the same person with this hashtag will be disqualified, as listed above. If you have any questions, please direct them to @authorandrew, without using the hashtag). Best of success on your chances in the giveaway, and spread the word around! Yippee! 😀 I love giveaways! Especially when they involve books. So, I just comment here, and I’m entered? Woohoo, love giveaways! count me in. I’m always wanting a new fantasy book to read. 😉 Count me in! Count me in, This book sounded really cool. I’d love a new book to read! I really want this book, Andrew. 😀 Count me in (course, you knew I would be posting, since I asked for permission, first). Yay! I’ve been wanting to read this book forevah! 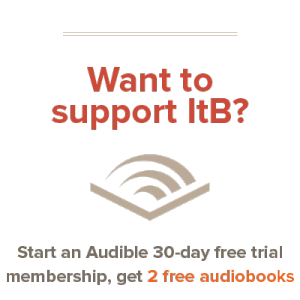 I’m so excited about this development for ITB! I found out about your giveaway from the Ink Slinger (thanks, Corey!). 🙂 I love books…….. I love books too. Watching this blog now. Thanks for the giveaway. Alrighty! Good to see we’ve got a whole lot of participants. The days to enter are soon winding to a close; you’ve only got 5 more! Remember to head on over to our Facebook page and Twitter to double or even triple your chances of wining!